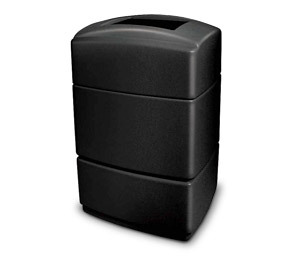 These large (12" x 10") sanitary pitch-in open top 40-gallon waste containers are a superior choice for gas stations, convenience stores and hotels. Made from 1/8" thick polyethylene plastic that is chip resistant, dent resistant and obviously won't rust, these waste containers are ideal for high traffic high volume areas. The Cove Isle windshield squeegee bucket and towel dispenser can be mounted to the 40-gallon waste containers to make a Waste 'N Wipe® Isle Convenience Center. This receptacle is made from 50% post consumer recycled (PCR) material. All models are shipped in a carton made from 50% recycled content.